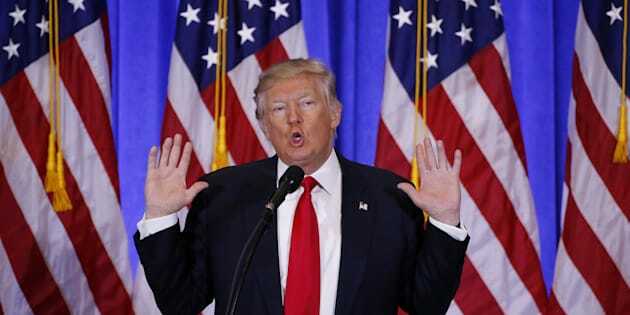 Donald Trump claimed at his press conference Wednesday that he has “very, very little debt,” for a real-estate developer. He repeated the statement three times, and went on to deny that he owed any money to lenders tied to Russia. Trump’s glib claim is hard to fact-check. After all, the definition of “very low” is relative. Trump holds at least $315 million in debt, by his own account ― and probably much more, according to estimates. To a wealthy person like Trump, who once lost nearly $1 billion in a year, most amounts of money probably seem tiny. But regardless of how you characterize the sums, Trump’s comments mask the complexity of his debt situation. Trump’s loans are spread through the financial system, according to a Wall Street Journal investigation from last week, opening him up to a raft of potential conflicts of interest. A financial disclosure Trump filed last year estimated he owes at least $315 million, but that number is probably far too low. The New York Times in August turned up more than $300 million in additional loans by searching publicly available data on real estate in the United States. The Journal’s investigation put Trump’s debt at a stunning $1 billion. As the Times explained over the summer, Trump didn’t necessarily lie in his financial disclosure forms. The federal forms just weren’t written for a candidate with finances as complicated as his. For example, the form didn’t ask for exact numbers, but in ranges ― and they maxed out at $50 million, the Times reported. And his campaign omitted from the disclosure properties in which Trump is not the sole owner. We’d know more if Trump had released his federal tax returns. On Wednesday he again refused to release his returns, saying he’s under IRS audit. Besides, he added, no one cares about his taxes except journalists. The bonds are held by more than 150 financial organizations, the Journal found, including JPMorgan Chase, Wells Fargo and Black Rock. When Trump is president, he will be responsible for appointing regulators of these institutions. Trump’s debts, in other words, are held by a who’s who of Big Finance. These institutions will have real leverage over the president of the United States. If a debt turns sour, they’ve got a bargaining chit. “The problem with any of this debt is if something goes wrong, and if there is a situation where the president is suddenly personally beholden or vulnerable to threats from the lenders,” Trevor Potter told the Journal. Potter served as a general counsel to the presidential campaigns of Republicans George H.W. Bush and John McCain. On Wednesday, Trump said his sons would run things while he is president and won’t discuss business with him. That’s hardly a clean break with the business. Trump will retain a stake in his company and will return to it when his presidency ends. The conflicts of interest from his debts are just one piece of the immense problem this arrangement presents. “It’s completely unprecedented,” Richard Painter told HuffPost’s Paul Blumenthal. Painter, the former top ethics adviser to President George W. Bush, said Trump is the only president in U.S. history to enter office so attached to his business interests.